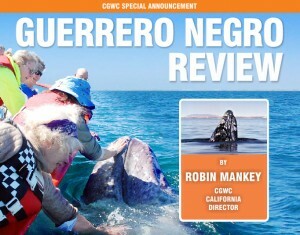 While this year’s migration has been spectacular, the threats facing the California Gray Whale remain substantial. 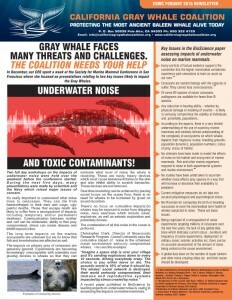 Of particular concern are the ever increasing levels of ocean noise and toxic contaminants which for the most part remain poorly measured let alone managed. 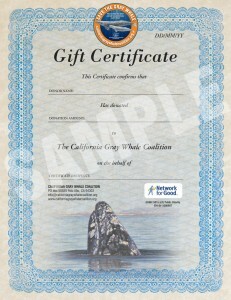 The California Gray Whale Coalition, in partnership with Ocean Conservation Research are planning an underwater noise workshop dealing with the impacts of noise on the marine environment in San Francisco in mid April. The purpose of the workshop will be to produce a white paper summarizing the gaps in research and in the regulatory framework and to ensure that legislation includes the impacts outlined as the only way proper management can be undertaken. To make the workshop a reality, we are requesting funds from valued members and supporters like you. Please click the green Donation button at the top of our Causes Page to make your contribution. Click HERE to go directly to our Causes Donation Page.